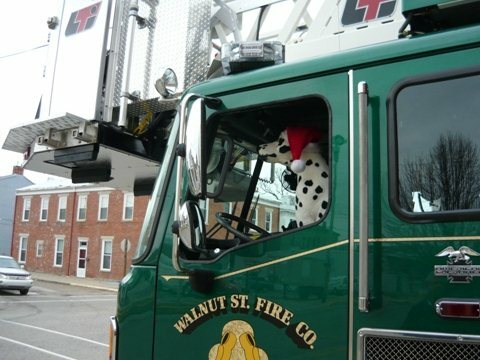 Walnut Street Fire Company No. 4 is steeped in history. 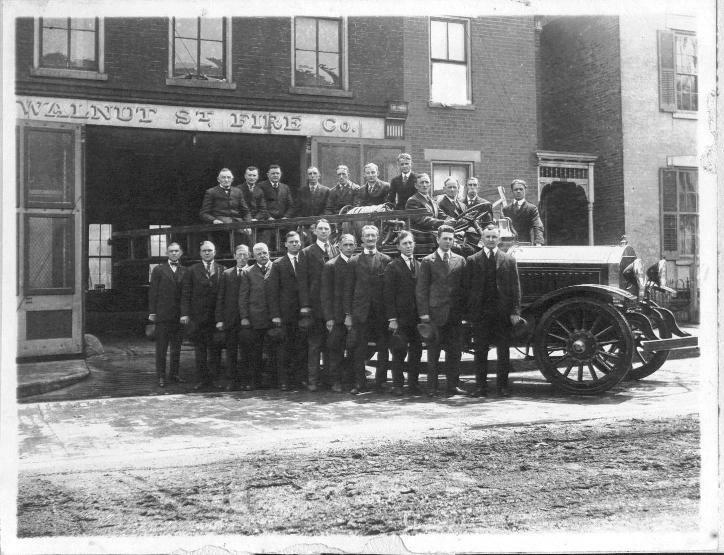 We’ve been in operation for 138 years and have had family members from many generations serve as volunteer firefighters. A very interesting part of this history is the evolution of our fire apparatus – starting with a hand-drawn horse reel in the early years of 1873 to a fully-integrated rear mounted aerial platform that we operate today. 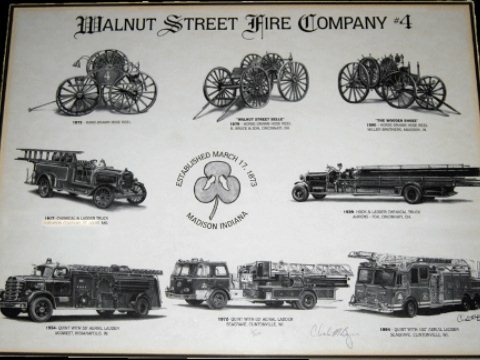 This page contains a brief chronological history of our fire apparatus starting with our first motorized truck. If you’re viewing this and have photos of any of these trucks that you would like to share, please email them to contact@firecompany4.com We are somewhat limited to the photo archives that we have maintained at our firehouse. 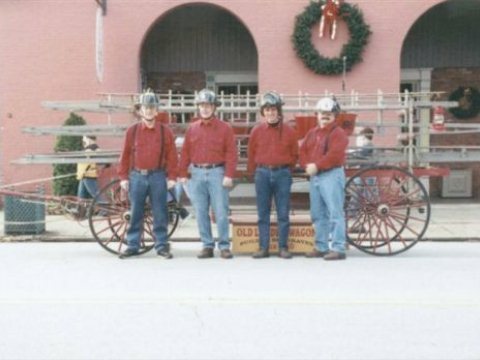 This is the last of the three non-motorized apparatus owned by the “Fours”, and is the only one of which a photo exists. The horse-drawn hose reel was built in 1890 by the Miller Wagon Works across the street from the firehouse at 808 Walnut Street. The lettering and company logo were painted on the hose reel by local artist William McKendrie Snyder. Although we don’t have the identities of the members in the photo, it was taken in 1894, making it likely that some of the older men were charter members when the company was founded in 1873. 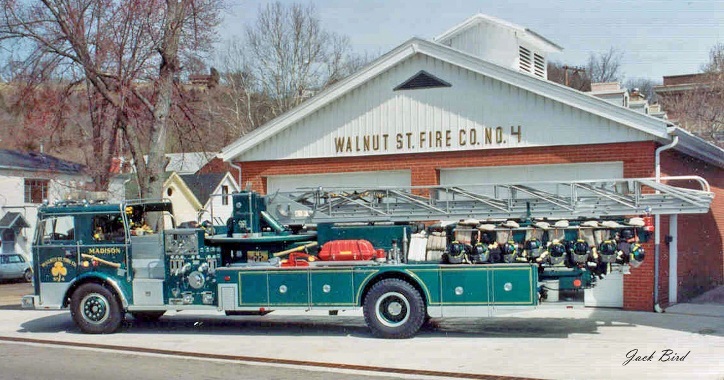 Walnut Street Fire Company No. 4 members are pictured in 1917 with the Robinson chemical truck. 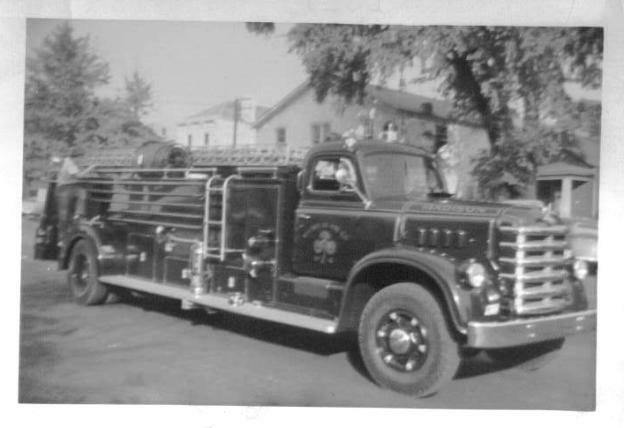 It was our first motorized truck following a hand-drawn and two horse-drawn hose reels. 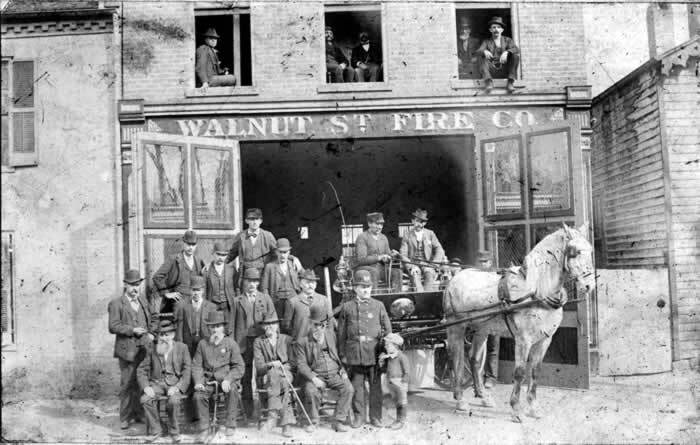 It was also the first motorized fire engine to go into service in Madison although it was not the first to arrive in town as is described in our History section. It had solid rubber tires and a pressurized booster tank. This is the official Ahrens-Fox factory photo of our 1929 city service truck that was in service until 1954. The truck now sits in our fire station after several years of serving as a parade piece for the Wabash, IN Shriner’s Club who sold it back to us at a very fair price. The truck had a pressurized booster tank, a full ground ladder complement and a large hose compartment, but did not come with a pump. A separate engine-pump system was obtained in 1952 from the Jefferson Proving Ground and placed on the truck requiring replacement of the booster and fuel tanks. However, the system did not work well and was removed two years later. 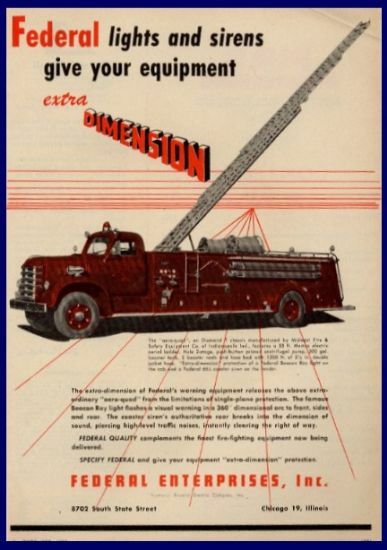 Our 1953 Midwest Quint built by Boyer in Logansport, Indiana had a Waukasha engine; a 750-gpm, 2-stage Hale pump; and a 3-section, electrically and manually operated Memco aerial ladder with no safety rails. It also had a full complement of aluminum ground ladders and a large hose bed. 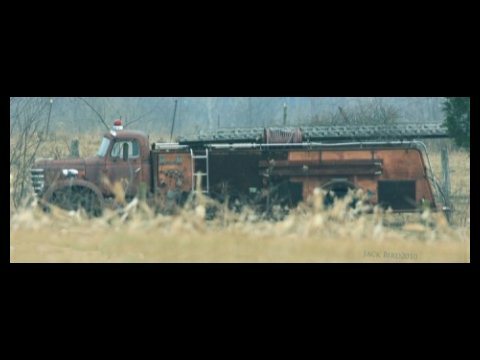 The truck is now rusting in a field near Kent, IN. 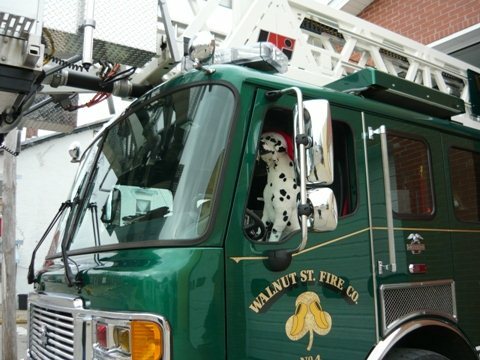 Walnut Street Fire Company No. 4’s actual Midwest truck was featured in an advertisement for Federal Signal trade magazines during the mid to late 1950s. We did not learn about these national ads until the 1990s. 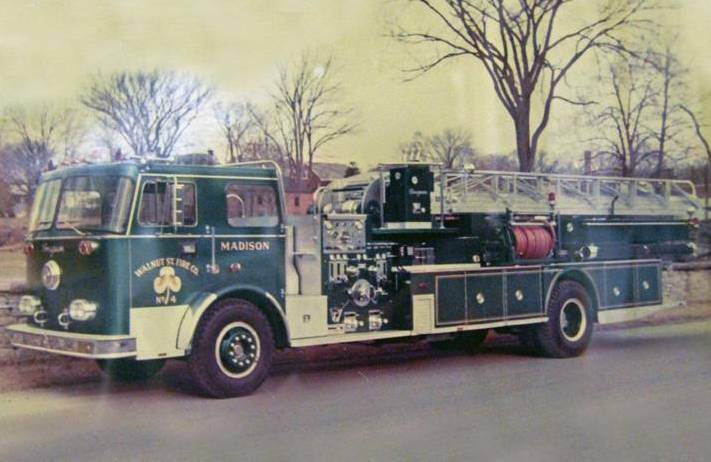 This is the 1973 Seagrave Quint, the first true aerial ladder and the first green truck in Madison. 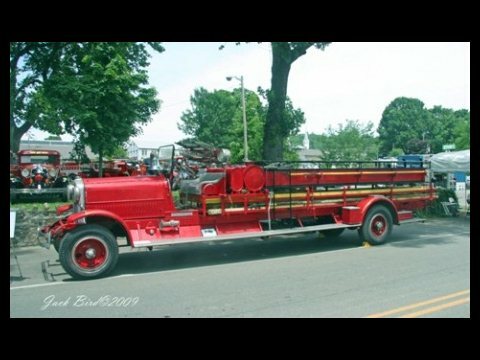 It had a Detroit Diesel engine with a 5-speed standard transmission and a 1,000 gpm, single-stage Seagrave pump. There were midship crosslays and the original booster lines were removed to allow for additional storage of portable equipment. 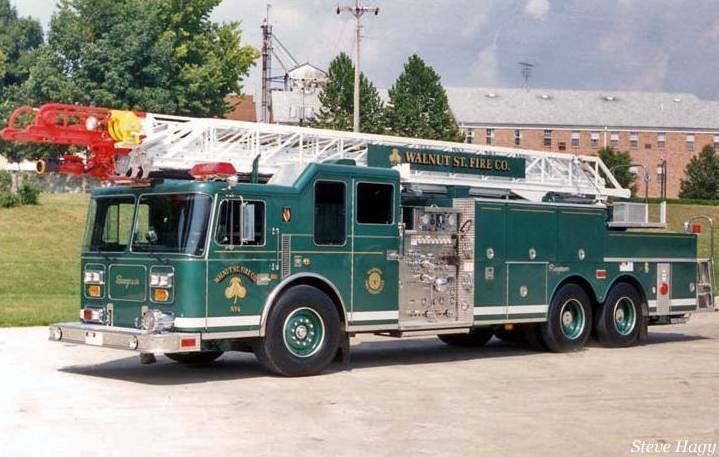 The single rear axle truck had a midship mounted 85-ft steel aerial ladder and had a full complement of ground ladders including a 40-ft Bangor ladder. The split hose bed provided for dual lays of 3″ supply lines. 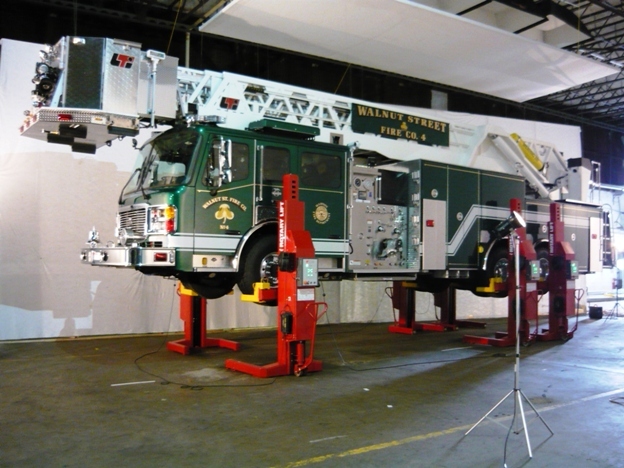 The truck was sold to the Jefferson – Craig Volunteer Fire Department in Vevay, IN when we replaced it in 1994. Recently, the 38-year-old truck was purchased by the City of Madison as a reserve apparatus for the Madison Volunteer Fire Department. 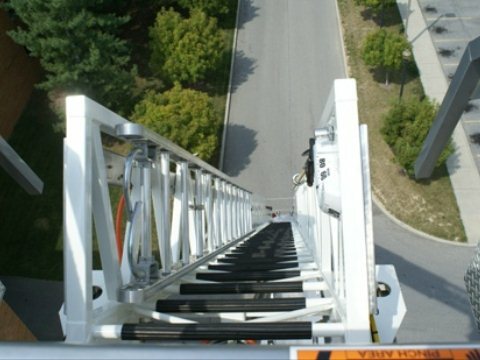 Today we operate a 2007 American LaFrance/LTI 100-ft Tower Ladder; 1,500 gpm, single-stage Hale pump; 300 gallon tank; there are 3 crosslays (1 3/4″, 2″ and 2 1/2″); and an 800-ft of 5″ supply line. 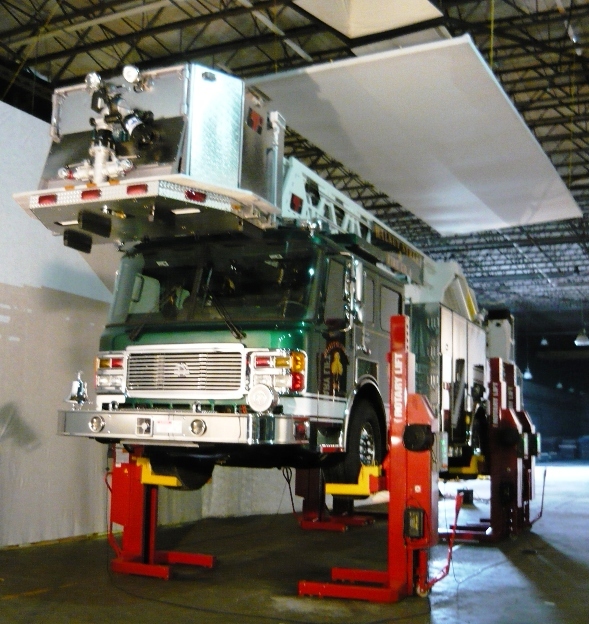 Left to right are the 2007 American LaFrance tower ladder, currently in service, its predecessor, a 1994 Seagrave 100-ft Quint, and the 1929 Ahrens-Fox. This is not the best quality, but it’s the only known photo of all three green aerial trucks together. The photo was taken at Madison Township Fire Department prior to a funeral procession for John Meike, a soldier who died in combat. 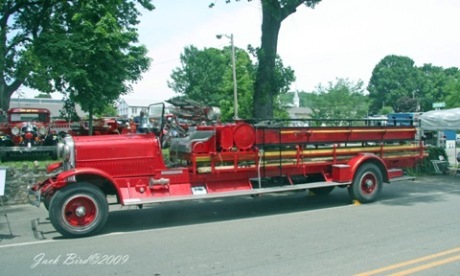 At that time, the 1994 Seagrave was serving as Quint 6 for the Madison Fire Department, and the 1973 Seagrave was in service at the Jefferson-Craig Volunteer Fire Department in Vevay, IN. 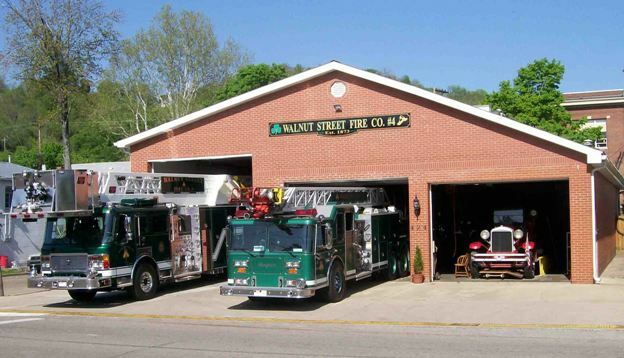 Walnut Street Fire Company No. 4 is one of six companies comprising the Madison Fire Department, and this is a picture of the colorful fleet taken several years ago. Several of the apparatus have been replaced, but a new group photo has not yet been taken. These are various photographs of fire apparatus in Madison, Indiana. To enlarge a photo or view the slide show just click on any of the pictures below. To end the slide show click on the photo you’re viewing.